Manuel Antonio is one of Costa Rica’s top visited destinations for its dramatic landscapes, lush forests and tree-swinging monkeys. Picturesque buffs rise from Caribbean-blue waters and jungled hills make for a photo-ready backdrop. Upscale hotels and unique restaurants are tucked into the folds of the hills and a long list of Manuel Antoinio adventure tours await any outdoor enthusiast. 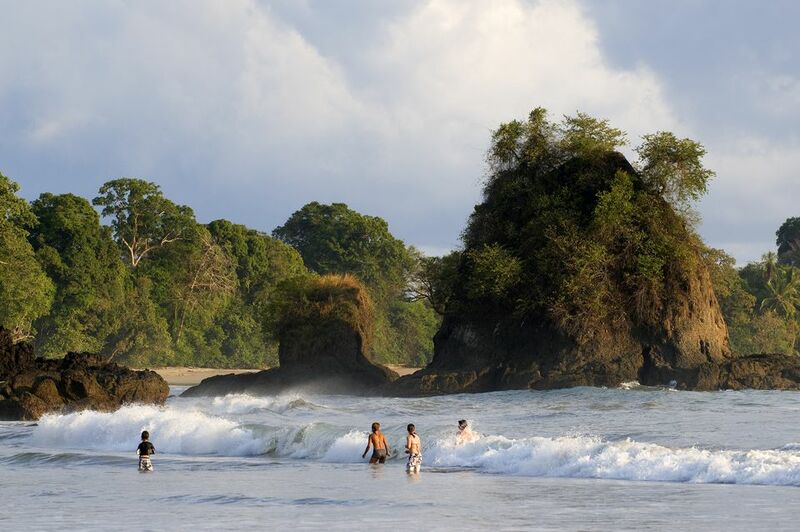 No visit to Manuel Antonio is complete without a visit to the Manuel Antonio National Park. Though the crowds can swell to uncomfortable levels (Manuel Antonio is Costa Rica’s most visited national park), it’s still worth while elbowing your way in to see the monkeys play in the trees or the anteaters poke among the vegetation. Go early to avoid the crowds (the park opens at 8 a.m.) and pack a lunch as there are no food stands inside. You won’t need a nature guide unless you have inexhaustible questions about the area or want the company. The bars facing the main public beach in Manuel Antonio offer 2-for-1 deals on their mohitos, cuba libres and daquaris between 4 p.m. and 6 p.m. This is a perfect spot to watch the incoming beach traffic or see the sun slip below the horizon. If you’re not much into the bar scene, wander down to the artisan stalls to shop for local crafts or relax on a park bench on the recently renovated cul-de-sac. Enjoy the catch-of-the-day from this hilltop restaurant, which was built to frame a massive US military plane. Not only can you enjoy incredible sunsets, but you can also wallow in history as you admire the Fairchild C-123, the sister plane to an aircraft downed in Nicaragua in the 1980s; a plane that inarguably tied the United States involvement to the guerilla wars. The one at El Avion, has been hollowed out and replaced with bar stools and liquor cabinets. You may choose rafting, ziplining, scuba diving or sportsfishing, but make sure you fit in at least one adventure tour during your time in Manuel Antonio. Afterall, this is the area's fortay. For scuba diving, check out Oceans Unlimited . A great zipline is Titi Canopy Tour or Dream Forest Canopy . For whitewater rafting, splash down the Savegre and Naranjo rivers with Amigos del Rio. A reliable sportsfishing team is Bluefin Sportsfishing . You did come to Manuel Antonio for a vacation, right? The area has a number of world-class spas and wellness centers, which would be a shame to pass by. The Rain Drop Spa has a chocolate therapy and massage for an hour and twenty minutes, which works vitamins C and B12 into the skin. Manuel Antonio's Spa Uno has a 50-minute warm stone massage with stones selected from a nearby river. The Serenity Spa at Hotel Si Como No has exfoliation treatments with Costa Rican organic products. Try the 50-minute Bamboo Lemongrass experience. And because few can afford the $400-a-night hotel rooms, take a peek at the Gaia Hotel & Reserve luxury retreat by way of its Terra Spa .